What is a DOT Drug Screen | Platinum Drivers Inc.
Drug testing is required for many positions today, including truck drivers. It’s important that employers know that their workers are not harming their bodies and putting the company at risk. So, if you’re interested in getting into this career, here are some things you should know about the drug testing and its requirements. First, according to the Federal Motor Carrier Safety Administration, or FMSCA, anybody operating a vehicle that requires a commercial driver’s license (CDL) is subject to these tests. So it doesn’t matter what you’re driving, if you have one of a CDL, you aren’t safe from taking one of these tests. Your employer, or in the case of a truck driver, your carrier is allowed to test for the presence of alcohol or drugs prior to them hiring you or when they have even the slightest of suspicion that you may be operating a vehicle under the influence. Once hired, your carrier is allowed to test you only before, during or after driving; it can’t be out of the blue when you are at home. They are also allowed to test you in case there is an accident that happens that involves a fatality. When that happens, they have to test for alcohol within 8 hours of the accident and within 24 hours if they are testing for drugs. Once your carrier obtains a sample from you, they will forward it to a laboratory certified by the U.S. Department of Health and Human Services. It will then be given a five-point screen that tests for the presence of alcohol or numerous different drugs. If your sample comes back positive for drugs or alcohol, you have to complete the Substance Abuse Professional evaluation, referral, education and treatment process outlined by FMCSA. Your carrier doesn’t have to administer any of that but they must make sure you complete it. Once all of that is done, you will be able to return to work. Platinum Drivers is a CDL driver staffing and placement service providing drivers in different areas across the country. If you would like more information on our business, feel free to contact us today! 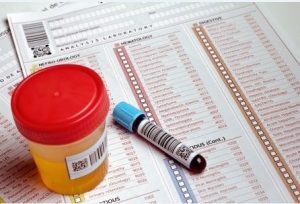 When Are Truck Drivers Subject to Drug Tests? What is a DOT Drug Screen?